The following descriptions will help you find just the right reviews for your intended purchase. Happy shopping! Fortunately for you, many people who buy products on Amazon also review them. You can find reviews on the same page as the product description. Amazon also uses a handy “questions” feature in which potential buyers can ask questions about the product that people who already own it can answer. When you have someone come into your home to perform a service, you want to be sure that person is reliable. Angie’s List helps by allowing you to search reviews for plumbers, roofers, electricians, landscapers, house cleaners, remodelers, painters, and HVAC professionals. When it’s time for a new car, this is the place to go to read customer reviews that will give you the real deal on each model. You’ll also find a detailed expert review of each one — covering things like features, performance, safety, and driving — plus links to information about that car for sale in your area. A company’s Facebook page commonly offers tips, product news, coupons, and other insider information. But did you know customers are leaving reviews there as well? It’s convenient if you’re already on the social media site and already interacting with that company’s page. 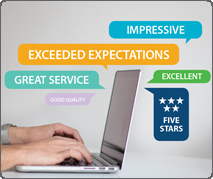 You might have come across Google Reviews without even trying, since reviews sometimes appear when you perform a Google search. To read more of them, click on the reviews link that shows up within the Google results page. To write one of your own, click the Leave a Review button. Glassdoor allows current and former employees to review their companies. This invaluable information source can help you get an insider’s impression of what it’s like to work at a certain place. In addition, the site features livestreams, articles, and other tools to help you find your perfect job. It’s important to know who’s looking after your health, and Healthgrades helps you find this critical information. Use the search function to research providers for a specialty or health concern in your area. Then get details like each provider’s bio, care philosophy, and education, along with patient ratings. When you travel, it’s really helpful to know what to expect from hotels, restaurants, and attractions. Trip Advisor shares tips, tricks, and photos from actual travelers. Learn how to get the most from your visit, then once you’ve been there, leave a review of your own. Among the most well-known of the review sites, Yelp allows you to provide a review for just about anything, from restaurants to home services to auto repair. Of course, you can also read reviews from others to determine what businesses to use. As a reader, you know how helpful an online review can be. How else would you know how much time you really need to set up that new surround-sound stereo system? Now think about how much more helpful reviews are when they include photos. That way you can actually see, step-by-step, why the stereo installation takes so long. Make your photo match your review. For example, if you’re raving about a dish you had at a restaurant, snap a photo of it to share. Avoid overly personal photos. A shot of you and your spouse at the Lincoln Memorial is great, but make sure Lincoln makes an appearance too. Think about what readers would want to see. If the outside of the establishment is unusual in any way, include it in the mix. Remember, reviews are great, but photos really bring your descriptions alive. Experience the product or service first-hand. This might go without saying, but don’t review anything you haven’t tried. A friend’s recommendation isn’t good enough; try on the clothes, use the device, visit the museum. Review readers are looking for personal experience, and you can’t provide it unless you’ve actually been there and done that. Take photos. If you’re reviewing a restaurant, take your photos before you start eating to show the dishes at their best. When reviewing a store, capture sections that show the product selection or the friendly faces of helpful staff. For an electronic device that arrived damaged, photograph the box and the item to show the exact nature of the problem. Wait for a day or two. If you want to post a negative review, wait a day or two so your emotions don’t get in the way of objectively describing a bad experience. If you’re displeased, first mention the things you did like about the product or service (there must be at least one or two). Then explain why, overall, the negative outweighed the positive. Discuss the entire experience. While it might be tempting to focus only on the most obvious factors, such as the selection and service at a clothing store, include other details like parking, hours, and ease of finding what you needed. Ask a friend to review your review. It might be “just” a review, but the easier it is to read, the more helpful it will be to others. Ask a friend with a good command of writing to look it over for spelling, grammar, and flow.